Simrad NSO EVO black-box chart plotter. This is essentially two independent chart plotters in one. It supports two screens, and each can be controlled as though it is stand alone. It even appears on the N2K bus as two distinct chart plotters. Although the EVO supports touch-screens, I'm not using them. perhaps I'll try them some day, but in my experience it's hard enough to operate push buttons in rough conditions, and I really can't see how a touch screen is going to make that easier. I find that I need to have my hand braced against something in order to control a button or mouse when the boat is really moving. I don't see how you can brace and touch. Touch seems great in the comfort of a show room or in the ICW or other placid waterway, but otherwise? I'd love to hear from anyone who is finding it works. I'm controlling my with an OP40 keypad designed for the purpose. Simrad HS70 satellite compass. These are great devices, though perhaps a bit finicky. It's 3 GPS received in a triangle and if I understand it correctly it creates it's own differential GPS station for greater accuracy. It also can determine a very accurate heading at all times, even when the boat is not moving by looking at the relative positions of the three receivers. A normal GPS can only give a heading when the boat is moving, and even then it's not very accurate. The HS70 also reports rate of turn, roll, pitch, and heave which is handy. 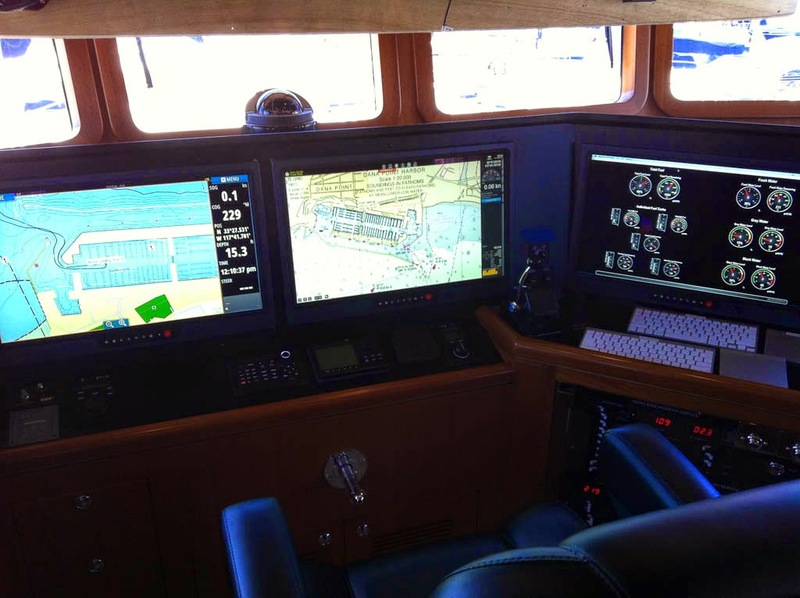 Simrad GS15 GPS. This is a more conventional GPS with all the usual modern features. I use it as a backup device in case the HS70 craps out. Simrad RC42 rate compass. This is a more traditional flux gate compass that also includes turn rate. It too is a backup in case the HS70 craps out. Maretron WSO-100 Weather stations: This is a solid state weather station that connects directly to N2K. It has no moving parts, yet accurately reports wind speed, direction, temp, humidity, barometric pressure, etc. I had something similar on the Grand Banks and really liked it. Simrad NAIS400: This is a class B AIS transceiver that links to N2K. There is a lot of debate over the incremental value of Class A over Class B. My feeling is that Class A doesn't provide enough incremental value to be worth the 2x to 3x cost. Class A reports more info about the ship and its voyage, like destination port and ETA. That's nice, but it is information that has to be entered by an operator, and in my experience 80% of the time the info reported by passing ships is incorrect, so what use is it? Class A also transmits at a higher power. I think it's 12W vs 2W. The extra power is nice, but almost always the limiting factor for AIS, VHF, and Radar range is the height of the antenna, not the power output. Class A transmits more frequently. This means more frequent position updates. This is also good, but I don't think really makes much of a difference unless you are moving at 30 kts. First off, both classes have varying transmission rates based on how fast the boat is moving. When stationary transmissions are less frequent, and when moving they are more frequent. The faster the boat is moving, the faster the updates. The key, though, it that AIS is always reporting a position behind the vessels actual position. This is readily evident when also tracking a target on Radar. The radar target which is always current and accurate, will show the boat ahead of the AIS target. Then the AIS target will catchup for a second when an update is received, then fall behind again. So although I love AIS, it's not really suited for accurate tracking of another boat's position. That's what Radar is for. Simrad XM Weather: I had this on the Grand Banks and frankly was not impressed. It just doesn't give a long enough forecast to be helpful, and if I want to know the current weather I can look outside. But I got the device anyway, partly because it was not very expensive. But I'm not sure if I will ever subscribe to the service. Simrad BSM Fishfinder. This is just a fancy depth and water temp sensor, but also shows the bottom contour and of course, fish. Airmar N2K depth/temp sounder. This is a secondary sensor. It doesn't provide the fancy imaging that the BSM does, but it gives depth and water temp. All this went together pretty easily and everything works except for some issues with the HS70. It appears to have at least on blatant bug whereby it acts on all N2K instance number changes regardless of which device on the network the change is for. It basically think they are all meant for it. Once everything is configured it's not a big deal, but it's a real pain when you are setting things up, changing configurations, testing, etc. It's pretty amazing that such a gross bug made it out the door, and it's another example of companies messing up Instancing. It seems pretty clear that very few people are building redundant N2K networks, or more people would be screaming about this. On Simrad's pro web site they list a FW update which we have tried to apply using three different computers with 2 different versions of Windows and have had no luck. And we don't even know if this issue has been fixed in the update. Unfortunately, talking to Simrad support is like talking to a stump. The other issue we are having, and the HS70 appears to be party to it, is a steady trickle of reported Fast Packet Errors on the N2K bus. I've been reading up on it to figure out what these error are, and N2K is limited to 8 byte messages. It also utilizes a Fast Packet Protocol to spit out a series of little messages which can then be reassembled by the receiver. That's about all I know, and presumably this error count is saying that those message groups aren't making it through properly. The AIS also appears to be party to these error. If either the AIS or the HS70 is turned off, the errors stop. And both of these devices send messages that are larger than 8 bytes, so use the Fast Packet Protocol. Functionally everything seems to be working, but I don't like seeing errors where there should be none. It's indicative of a problem, and such problems usually surface at a most unwelcome time. Going back to all the redundant devices, this is where Instancing is vital to making everything work. Simrad a nice extra feature called Simrad Groups. You can set up their devices to be part of a Simrad Group for each type of data that it might use. So, for example, a depth display could get it's depth data from either the fish finder or the depth sounder. You can manually select one or the other by specifying it's instance number, or you can say you want it to use whichever source the Simrad Group is using. This makes it really easy to change sources across the board. 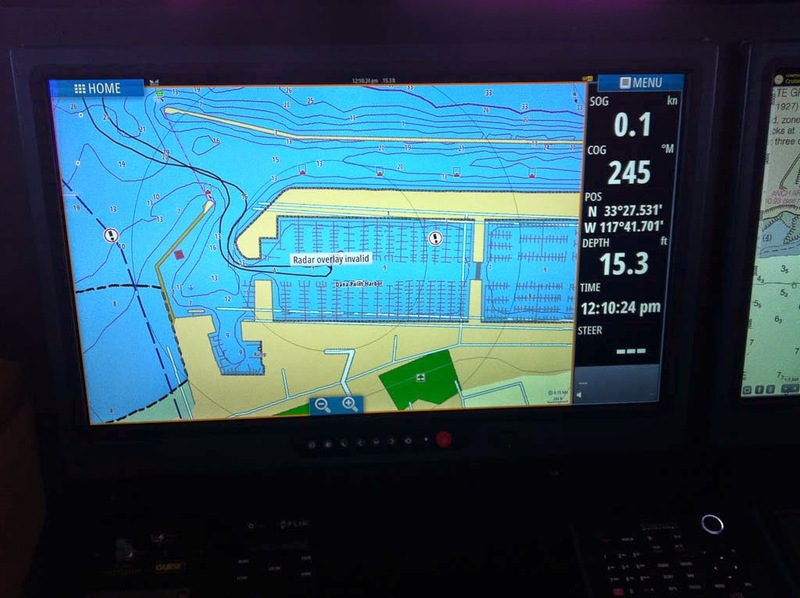 From the chart plotter, you can change the depth source from the fish finder to the sounder, and all members of the Simrad Group will change accordingly. Without this you would have to go around to each device and change it's source. I got a chance to test this out when we went to Catalina. At one point the HS70 went completely dead, I think because of the failing VHF (I hope), I was able to change the GPS source to the GS15, and change the Heading source to the RC42, and we were back in business for all systems. I think that covers it. In summary pretty much everything is working, save a few nuisance problems. You know, I'm really not sure. The NSO was the only device that reported on that as an error, so once the NSO went away, so did the report. That said, I always had a weird issue with Coastal Explorer where it would periodically, and just fro a brief moment, say it there was no GPS fix. It was never enough to generate and alarm or any mis-operation, but the GPS status window would say "no fix" for a second or two. Rose Point looked into this for me and said that periodically there was a gap/delay in the delivery of the GPS status message. It's supposed to come every 1/2 second as I recall. Anyway, what I have noticed is that since removing the Simrad gear, I haven't seen any more "no fix" events on Coastal Explorer. I don't know, but it's entirely likely that these were due to Fast Packet Errors since the GPS status messages are indeed Fast Packets.